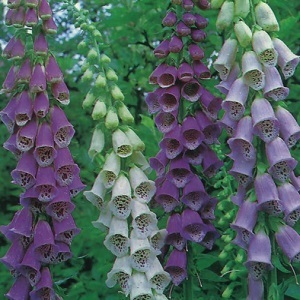 An attractive mix of Foxgloves, with tall spikes of flowers in June and July in shades of white, purple. rose and cream. Excelsior Foxglove plants grow to a height of 1.5m – 2m, and are good for back of borders, wildflower and wooded areas. They attract butterflies and bees into the garden. They make excellent cut flowers. Excelsior Foxgloves grow best in part or dappled shade and well-drained soil. Plants will flower in full sun. Protect flower spikes from strong winds. Pack of approx 1000 small seeds. Sow in spring to summer, moving the plants to their final position in autumn for flowering in early summer. Sowing instructions and a colour photo are printed on the packet. Caution: The plants are toxic if eaten. Conditions Part or dappled shade or full sun in well-drained soil. Sow in spring/summer for next year flowers. Sow in a tray or cells of seed compost, press the seeds lightly into the soil and do not cover. Do not exclude light which helps germination. Spray with a general garden fungicide. Keep at 18-20°C and seedlings emerge in 1-2 weeks. Pot on and plant out after the last frost or in the following spring. Grow Plants form a rosette of leaves in the first season and grow flower stalks in the second season. Cut back the flower stalks later in summer once they have died back. A rosette of evergreen leaves sometimes remains over winter and the plants may flower for another one or two seasons. They often self-seed, but not necessarily in the same flower colour.